All signed partners should have full access to all Boyum- and Beas-software. How to activate the partner license? In regards to CRM for Outlook: you need to ask an admin (= user of the Boyum Portal) to set you up as a CRM for Outlook user and you will receive an activation email. Click on below links to see how to install the software on the server and then on the client. 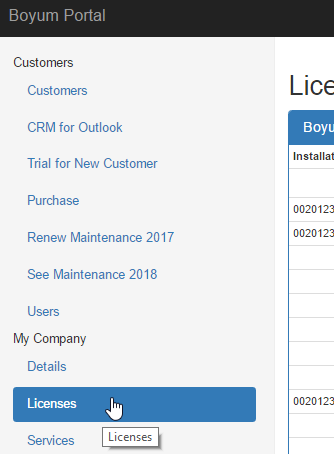 The installation number of the partner license is visible under "My Company" -> "Licenses". Admins of the Boyum Portal can see this information. It's recommendable that all employees who deal with the partner license has access to the portal. You can ask an admin to set you up as a new portal user. If needed, you can request the manual license key here! What if I don't know which installation number is used for my company's partner license? The installation number is added to the account in the Boyum Portal when signing up as a partner. To see the installation number, please get into contact with an admin in your company who can access the portal and view all partner licenses. If you need help to identify an admin or a license registered for your company, you can text sales@boyum-it.com and we will assist you.